Should You Take Calcium & Baby Aspirin at Night on an Empty Stomach? Taking some nutrients and medications at night makes sense because of the nutrition or therapeutic effect they can provide during the roughly eight hours most people are asleep. Calcium is utilized at night, although it may be used by your bones and muscles more effectively during physical activity. Aspirin, even in low doses, should not be taken on an empty stomach because of the increased risk of stomach upset and gastric ulcers. Calcium is an essential mineral for strong bones, muscle contraction and a variety of biochemical reactions related to your nervous system. Unlike fat-soluble vitamins, calcium doesn't need to be taken with food in order to be absorbed within your intestines. In fact, taking calcium carbonate with food can interfere with iron absorption. Calcium absorption is enhanced by vitamin D, which is made by your skin in response to certain frequencies of sunlight, but vitamin D is stored during the day when produced in abundance and is available at night for your body to use, according to the book "Advanced Nutrition and Human Metabolism." Mineral loss from your bones does occur at night, which is why some health experts recommend taking calcium just prior to bedtime, although others contend that calcium is better utilized by your muscles and bones when you are moving them during physical activity. Furthermore, taking calcium and magnesium prior to bedtime may help induce sleep and prevent muscle cramps. Aspirin, also known as acetylsalicylic acid, is a drug that displays analgesic, antipyretic and anti-inflammatory properties. In other words, it helps to relieve pain, fever and inflammation. Aspirin has been used for over 100 years by doctors, but it can cause stomach irritation, ulceration and gastrointestinal bleeding in users. In the last couple of decades, aspirin has been promoted as being able to reduce the risk of cardiovascular diseases, so doctors commonly recommend its use for people at risk of atherosclerosis, embolisms and heart attack. Adult dosages are typically 325 mg per tablet. 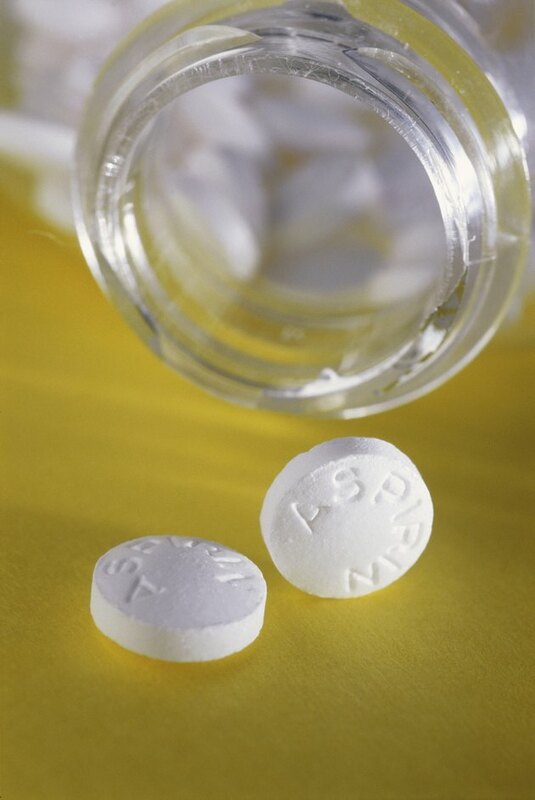 Baby aspirin are low-dose varieties, usually 81 mg per tablet, that are more appropriate for the smaller sizes of children or for adults who take aspirin daily for prevention of cardiovascular diseases but who want to reduce their risk of negative side effects, according to the "PDR Guide to Drug Interactions, Side Effects and Indications." However, even low-dose aspirin should not be taken on an empty stomach because of its acidity and negative effect on the mucosal lining of your stomach and intestines. Food helps to buffer the effect of aspirin. Aspirin should not be taken with any kind of alcoholic beverages either. Taking calcium with aspirin or baby aspirin may help buffer the acidity in your stomach and reduce the risk of irritation, which is why some types of aspirin are coated with calcium carbonate, according to Drugs.com. Consult with your doctor about the most appropriate doses of aspirin, the best time to take it and whether or not you should combine it with any supplements. Does Calcium Interfere With Clindamycin?